Across the country, people are debating the art we display in public spaces. In the southern United States, controversies surround Confederate memorials such as statues honoring Robert E. Lee. In Minnesota, debates have swirled around historic art in the Minnesota State Capitol and the stories it tells about Manifest Destiny and white supremacy. More recently, attention has focused on the Depression-era murals in the Ramsey County Courthouse. This page is dedicated to following the debates about changes needed to historic art in our civic spaces, such as the state Capitol or the St. Paul City Hall Chambers. People need to engage in these spaces if they want to speak to the issues of the day. We need to examine the art that diminishes or disrespects a certain portion of our population and makes these spaces unwelcoming. One of the four murals. The St. Paul City Council and the Ramsey County Board of Commissioners share a chambers in the Ramsey County Courthouse. Four large vertical murals dominate the chambers. Each mural depicts a scene from St. Paul’s development, from early explorers to an industrialized city. Filling the top half of each mural is a white man: A voyageur, a surveyor, a river boat captain and an industrial worker. The bottom of each mural has a series of smaller scenes. Women are almost absent from the art. When a scene shows a white man with person of color, almost without exception the white man is positioned above them in the place of power. For instance, there is a small image of an explorer and a Native man in a canoe; the Indian paddles while the white explorer coasts while cradling a gun. In another image, a priest extends a cross of conversion to two Native men positioned below him. In yet another, a businessman and his wife disembark a train while the African American porter carries their bags. An inset in one of the murals. The Ramsey County Historical Society is creating a task force of community members to select and guide local artists to create new art. The current plan is for contemporary art to cover two of the four murals at any one time. The covered murals will rotate, so two will remain visible at all times. These are not welcoming images, and civic leaders need to push to have all four murals removed and rehung in a museum or other venue where they can be properly interpreted. The state of Minnesota completed a $330 million renovation of the state Capitol in 2017. (Details available at the Minnesota State Capitol Restoration Project website.) The Capitol Preservation Commission created an Art Subcommittee to examine this issue and make recommendations about historic artwork and the controversies it created. The Subcommittee finished its work, and while it made some changes, problems remain. Much of the Capitol art dates from the time of the building’s construction in the early 1900s, and it offers scant if any representation of our state’s increasingly diverse population. Further, some of the pieces misrepresent our history and put Native Americans in an offensive light. We had a once-in-a-lifetime opportunity to reassess the art, the story it tells about who we are as a people, and how we want to illustrate what we value most. 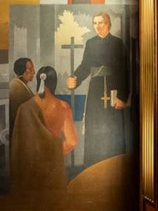 The most significant change put forward was to move two controversial paintings — Father Hennepin Discovering the Falls of St. Anthony and the Treaty of Traverse des Sioux. They had hung in the Governor’s Reception Room. They will stay in the Capitol, but be moved to a less prominent space. Meanwhile, paintings like the one below got a fresh touch up and will stay in place. If you want more background on the issues, MinnPost ran an excellent piece, titled: The other debate at the state Capitol: What to do with the building’s most controversial art? Jan. 25, 2016 blog: Columbus Monument in Disrepair: Will it Get State Money? Dec. 8, 2015 blog: Option floated to move controversial art. We have started doing some quick Internet searches to see what we can learn about art in other state capitols. Are there other controversies? Are there innovative approaches to interpreting existing art or adding new art? 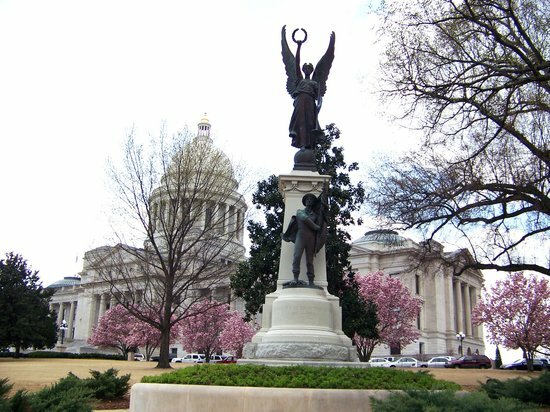 Alabama: While the Confederate battle flag no longer flies over the statehouse, a controversial Confederate Memorial Monument still sits on the capitol grounds,. Further, paintings in the capitol rotunda reflect the offensive values of the Jim Crow South. Our May 9, 2015 blog raises the question of whether depictions of African Americans in the Alabama State Capitol art are any different than depictions of Native Americans in Minnesota State Capitol art. Arizona: Both Minnesota and Arizona have capitol art with iconic images of Manifest Destiny and of the Catholic missionaries who came to convert the native peoples. One piece worth noting is: Spirit of Arizona, with its classic symbols of Manifest Destiny. The Indian is leaving the scene, replaced by white settlers and signs of divine intervention–angelic spirits carrying agricultural bounty. The painting’s symbolism is similar to a painting in the Minnesota Senate: “Minnesota, Granary to the World. Arizona has its historic Capitol art in the Arizona Capitol Museum, separate from the day-to-day operations of state government. For more on the Arizona capitol art, see our May 13, 2015 blog. 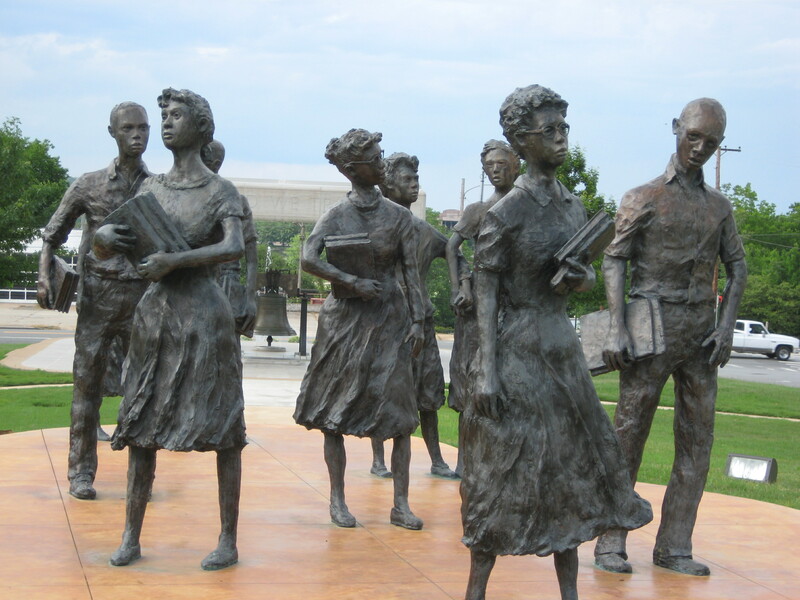 Arkansas: The Arkansas Capitol grounds feature a number of monuments, including two to honor the Confederacy and one honoring the Civil Rights movement (“Testament: The Little Rock Nine Salute”). One striking thing is how the text interpreting the confederate monuments focuses on trivia and avoids the bigger issues of the power of these symbols. For instance, the self-guided tour text about the Monument to Confederate Soldiers avoids any historical context, but has this irrelevant nugget: “In 2004 the monument was cleaned, its base repaired and the surrounding landscaping reconfigured to resemble its early appearance.” It seems some things are still too difficult to talk about. For more on the Arkansas capitol art, see our May 19, 2015 blog. California: The California State Capitol art includes images of conquest and the cross, from the prominent statue of Christopher Columbus and Queen Isabella in the rotunda to the statue of Father Junipero, the founder of California’s first missions. A capitol mural done by husband and wife team Arthur and Lucia Mathews includes a panel showing the arrival of European settlers, idealized as a Knight Errant and priest, with California’s native peoples shown in subservient roles. For more, see our May 26, 2015 blog. Colorado: The art and monuments on the Colorado state capitol grounds tell the tale of two genocides. It has one monument remembering the Armenian genocide, the first genocide of the 20th Century. It has another monument to Colorado soldiers who fought in the Civil War and other 19th Century battles–including the “Battle of Sand Creek,” a massacre of 150 Cheyenne and Arapaho Indians, mostly women, children and the elderly. It is a symbol of the Native American genocide, but not named as such. Colorado has added a new plaque to characterize Sand Creek as a massacre and not a battle. The juxtaposition of the memorials raises the question of whether we are yet able to look honestly and fully at our nation’s history with Native American peoples. For more on these and art at the Colorado capitol, see our June 1, 2015 blog. Connecticut: Connecticut is the first capitol we have reviewed that appears to make no reference to Native peoples in its art. Perhaps its not surprising since the current capitol opened in 1878, long after Native peoples had been forced out of the state. Of note is the Connecticut State Seal with the motto: Qui transtulit sustinet. It is a powerful statement of Manifest Destiny. The phrase is Latin for He Who Transplanted Sustains. For the explanation, see our June 8, 2015 blog. Delaware: We skipped Delaware for lack of information on line. Florida: While the Minnesota State Seal has been criticized for showing an Indian riding off into the west, here, the Florida State Seal gives the illusion that Indians were still happily welcoming Europeans with flowers when by 1868 they had been brutally driven from the land. For more on Florida’s state symbol and capitol art, see our June 17, 2015 blog. Georgia: Part of Georgia’s troubling history with Native Americans includes the expulsion of the Cherokee peoples from their ancestral home, which led to the Trail of Tears. According to a review of more than 200 pieces of Georgia capitol art cataloged online, only one painting was found acknowledging any Native American presence in the area, and that one featured an early peacemaker. For more on Georgia’s capitol art, see our July 17, 2015 blog. Hawaii: The Hawaii State Capitol art and architecture honor the Hawaiian environment and Native leaders. The building has a volcanic shape, a symbol of the islands’ birth. Forty columns rising 60 feet high surround the building like the royal palm trees. Surrounding reflecting pools represent the Pacific Ocean. For more on the capitol, see our July 24, 2015 blog. Idaho: Called the Capitol of Light, the Idaho statehouse leaves the history of Native peoples in the shadows. There is no art in the capitol that tells their story. 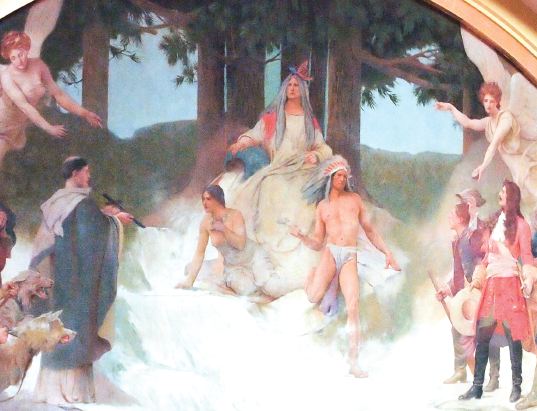 As far as lessons for Minnesota’s capitol art, the most important case study concerns a controversial mural of the lynching of a Native American man displayed in the temporary meeting space used by the state legislature during renovation. For more, see our July 28, 2015 blog. Illinois: The Illinois State Capitol has a number of pictures of Native Americans, and they are all showing scenes pre-1900. Similar to Minnesota’s capitol art, one major piece has been criticized for its flawed depiction of Native Americans who lived in the area. For details, see our August 3, 2015 blog. Indiana: One of the most interesting aspects of the Indiana state capitol is that the Hoosiers have not felt compelled to keep it in its original 1888 condition. (Staff at the Minnesota Historical Society have said that it is in their DNA to do preservation. As part of the renovation, they are trying to keep the Minnesota State Capitol as close to its 1905 appearance as possible.) According to the Indiana state website, both the House and Senate chambers “have seen extensive renovation not in keeping with historic tradition.” For more, see our August 8, 2015 blog. Iowa: While the state’s very name is rooted in the name of an Indian tribe, an online search of Iowa capitol art found almost no images of Native Americans. One large piece of art (a sculpture) features a Native American, who is described simply as “friendly.” Iowa’s capitol art mirrors that found in the Minnesota State Capitol. For more, see our August 22, 2015 blog. Kansas: Kansas has had its share of capitol art controversy, from a spat over putting a pagan god on the capitol dome to cattlemen who thought a muralist had done a poor job of capturing the image of a Hereford bull. In general, Kansas capitol art did not have the angels and cherubs of Manifest Destiny found in the Minnesota capitol, but the art still stresses importance of westward expansion and a romanticized view of early settler life. For more, see our August 25, 2015 blog. Kentucky: Kentucky’s capitol is particularly interesting for Minnesota since in 2010 Kentucky added significant new murals to its rotunda. Like Minnesota, one of Kentucky’s large historic paintings features a major land treaty with Native Americans. For more, see our Nov. 6, 2015 blog. In a related note, see our Nov. 28, 2015 blog on the decision by the University of Kentucky to cover a controversial mural. Louisiana: Some of the most interesting art in the Louisiana State Capitol is found on its ornamental brass doors. For more, see our Nov. 12 blog. Of related interest, the City Council of New Orleans voted in December to remove four prominent monuments honoring Confederate leaders and racial segregation. See our Dec. 26, 2015 blog. Massachusetts: The art in the Massachusetts Statehouse includes images of peaceful and praying Indians, but ignores the deep harm done. The first Massachusetts Colonial Seal features a Native American man in a grass skirt saying: “Please Come Help Us.” See our Oct. 16, 2016 blog. Minnesota: We have commented on the Minnesota Capitol art elsewhere, but here is an additional blog on the statue of Gov. Knute Nelson that, until recently, had flown under our radar. Wisconsin: Wisconsin Once Had Ho Chunk Capitol Tour Guide Focused on Native Culture, What Happened? See our March 12, 2017 blog.